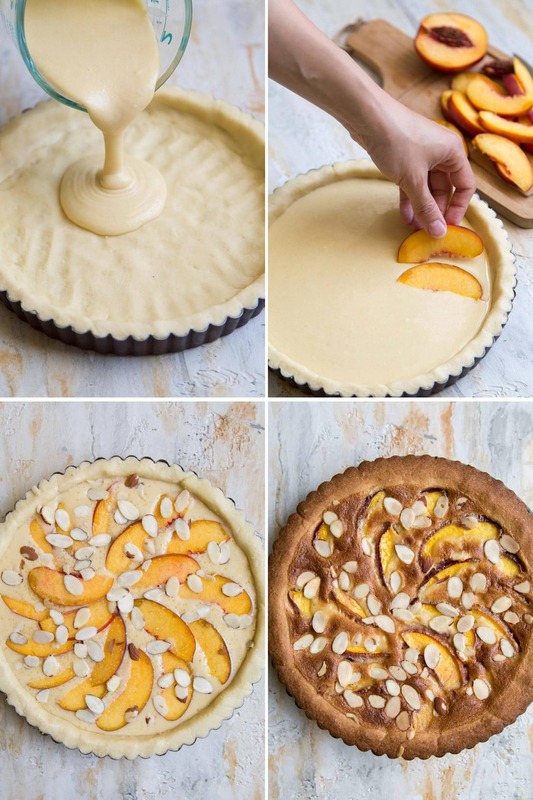 This nectarine frangipane tart consists of an almond shortbread crust and a creamy almond filling topped with nectarine wedges and sliced almonds. The tart is baked to a golden brown and garnished with powdered sugar. It’s hot outside. You have the AC blasting. I know the last thing you want to do is turn on the oven during summer. I say, turn it on! Let your oven work for an hour. 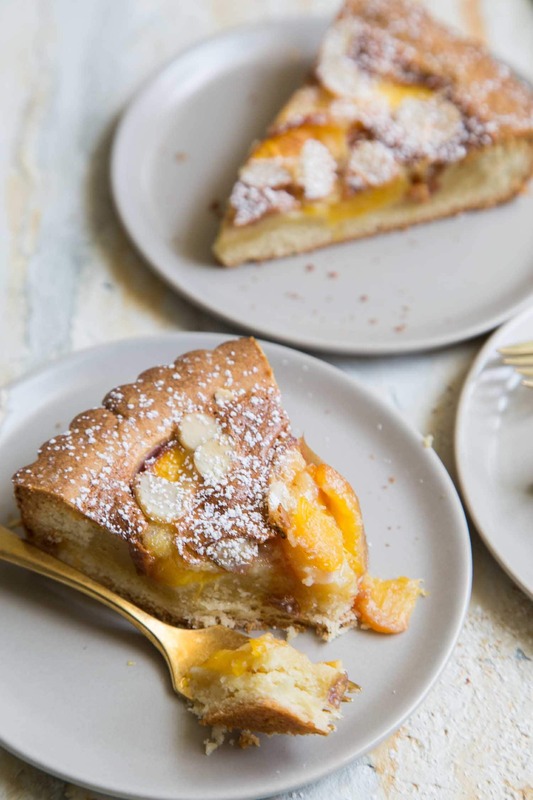 Sure, you might sweat a little in a process, but you’ll be rewarded with this scrumptious, can’t stop/won’t stop eating until you finish it all, delicious nectarine frangipane tart. 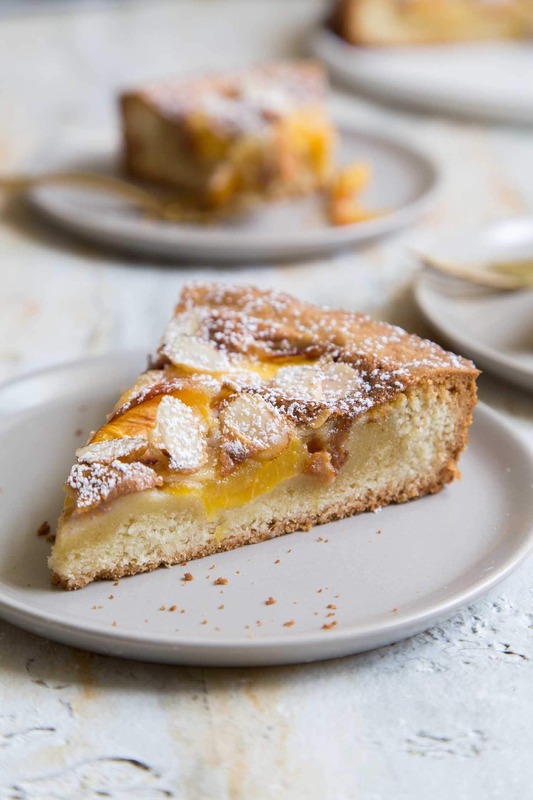 Frangipane is a creamy custard filling made with almonds. It is used to fill various pastries, tarts, and other baked goods. Frangipane is typically made by combining ground almonds with butter, sugar, and eggs. Is frangipane the same as marzipan? How about almond paste? NO. Frangipane and marzipan are not the same. Marzipan is an almond candy. It has the texture of soft dough (or soft taffy) and it is made by combining almond paste and sugar and glucose until it becomes a soft clay like mixture. Marzipan is often sculpted into different shapes (like mini fruits and veggies, flora, and little cute animals). Almond paste is similar to marzipan, but far less sweet. It is often sold in tubes or cans. Almond paste is a thick clay-like dough made from processing together almonds and sugar. It is used as a filling for pies, cakes, and cookies. It can also be used to make frangipane. The dough for this tart does not require any rolling. The cookie-like dough is simply pressed into the tart shell. Use the flat bottom of a drinking glass or measuring cup to evenly spread and distribute the dough. The frangipane filling is poured into the tart shell. Nectarine wedges are arranged on top. (You can also substitute in peaches or plums, if desired.) Sliced almonds and turbinado sugar are sprinkled on top. The tart is baked for about 45 minutes until deep golden brown! Don’t worry if the crust puffs up during baking. It will deflate. Yes, you want the tart is be DEEP golden brown. The frangipane filling needs to be baked until it no longer jiggles in the center. If you are worried about over-baking the crust, simply cover it with foil. 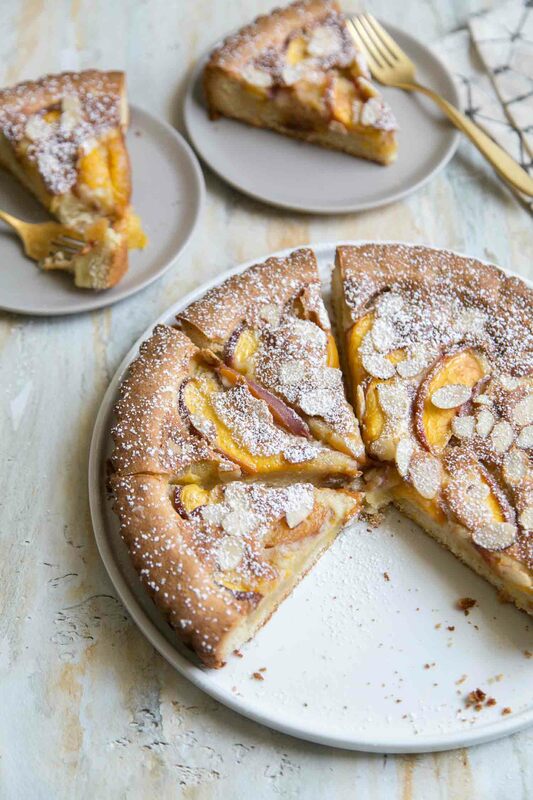 After baking, the nectarine frangipane tart gets dusted in powdered sugar. The tart can be enjoyed warm, room temperature, or chilled. 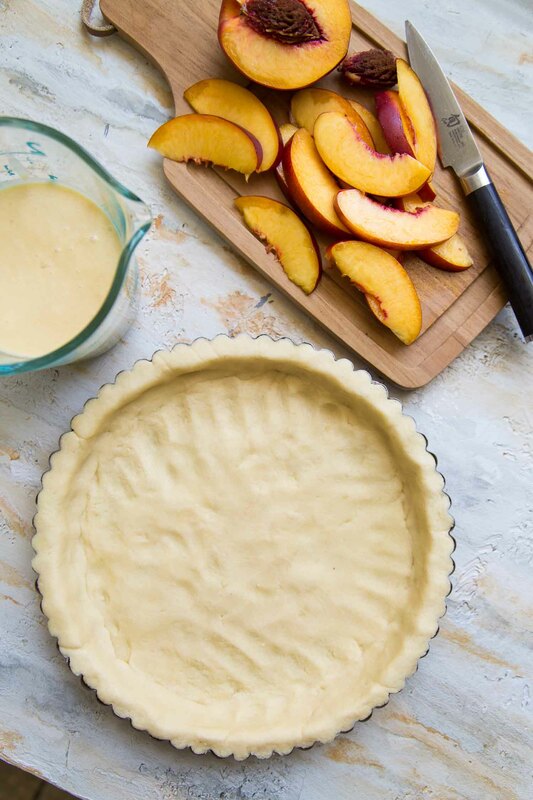 Allow the tart to cool for at least 20 minutes before slicing. The filling needs time to regain it’s structure. How does it taste all together? 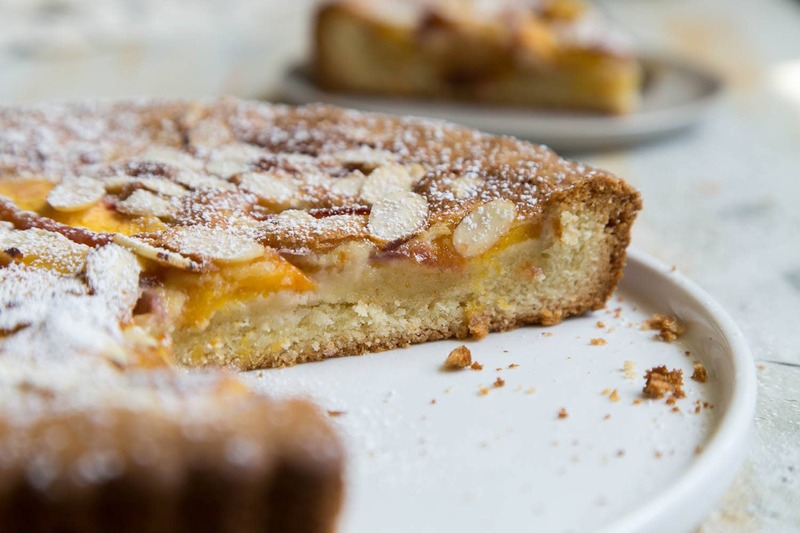 Can you see the distinct layers in the cross section of the nectarine frangipane tart? The shortbread crust is made with ground almonds. The creamy frangipane layer is made from almond paste. And finally, you have toasted sliced almonds on top. All together, it’s definitely an explosion of almond flavor. Paired with the sweet nectarine, it’s a playful combination that’s super addicting and delightful. I dare you to slice yourself a small sliver. Within minutes you’ll be cutting yourself another slice. 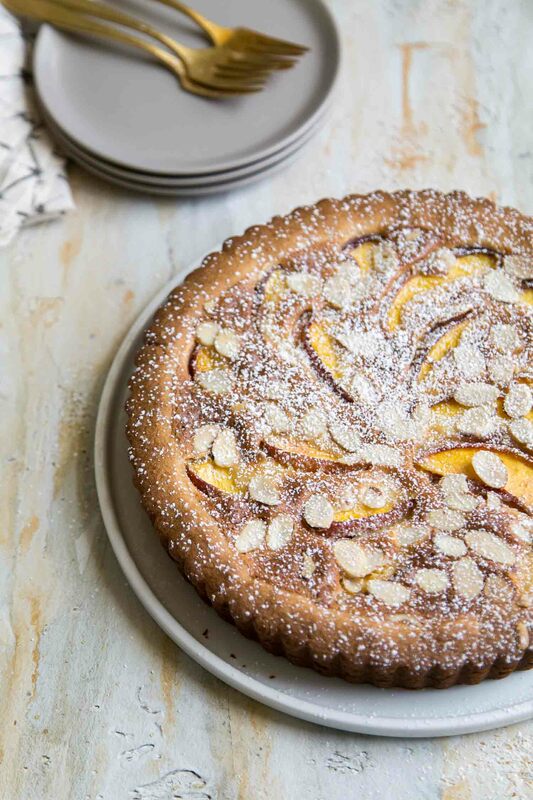 This nectarine frangipane tart consists of an almond shortbread crust and a creamy almond filling topped with nectarine wedges and sliced almonds. CRUST: In the bowl of a stand mixer fitted with a paddle attachment, cream butter and sugar. Add egg and mix until well combined. Add almond flour, all-purpose flour, baking powder, and salt. Mix just until dough comes together and there are no longer any dry streaks of flour. Dough will resemble cookie dough. Scrape out dough and flatten into a small rectangle. Cover with plastic wrap and let chill in the fridge for 30 minutes. Press dough into tart shell (with removable bottom). Use the flat bottom of a drinking glass or measuring cut to evenly spread and distribute dough into an even layer. Cover with plastic wrap and keep chilled in the fridge while you preparing filling. FILLING: In a food processor fitted with blade attachment, combine almond paste, sugar, and butter. Pulse until well blended. Scrape down bowl as needed. Add eggs one a time, pulsing until incorporated. Add vanilla, salt, baking powder, and flour. Process until mixture is smooth. BAKE: Pour filling into chilled crust. Arrange nectarine wedges on top as desired. Sprinkle sliced almonds and turbinado sugar on top. Bake for 45-55 minutes until crust is well golden brown and the filling center no longer jiggles. I used this blanched super-fine almond flour. If you use regular un-blanched almond flour, the shortbread crust will be slightly darker in color and speckled with the almond skin. Peaches or plums can be used in placed of nectarines. I used this almond paste. Do NOT use marzipan.